Do you love your AquaTeak® shower bench, outdoor bench, or other AquaTeak® product? Submit your testimonial below! Before you do, read testimonials from our other happy AquaTeak® customers. I just ordered a 36” shower bench from Aquateak. What a great product! It’s very well constructed and the fit and finish is superb. The bench is for my father but I’m ordering a duplicate to inspire completing my new master bath shower. I had been intending to submit a review for several days, and I just did. Amazing product, and we are thrilled with it! We will likely order more for other bathrooms! Five stars and I love it. May even order another one. Words can not express how impressed and in love with my teak shower bench! Your benches are amazing and beautiful. I definitely will be buying from you again in the future. 5 stars doesn't seem fit for my bench. 100 stars for quality, workmanship and material is more like it. Thank you again for such a beautiful piece! . I am so happy with my Spa Teak Oval Shower Organizer. I’m actually not using it as a “shower organizer” but have hung it on my bathroom wall to display some glass pieces. It is so gorgeous! I am thrilled that I found your products and have also purchased a wall shelf with hooks for towels. I love the smell of the teak as well. I am thinking about outdoor chairs, although I didn’t realize they wouldn’t be available for 3 or 4 months, but, it’s something I could have next summer. Again, I am so glad I discovered aqua teak and will definitely pass on your wonderful products to others! It is so refreshing to find such high quality products. I thank you so much. We love this product...better than any bathmat ever made. Believe me, we will be ordering more as gifts. Thanks again! I’m extremely pleased with the quality of your customer service. I had originally order a 30” shower Teak Shower Bench before realizing it would not fit in our shower. Called to change to a 24” bench instead and was accommodated immediately! I received the correct item and was credited with the difference in cost immediately. Seldom I have experienced such an attentive service, and by the way a fantastically well-built product. Thank you. Purchased (The Original 18" Sumba Teak Shower Bench with Shelf) yesterday though Amazon- arrived today. Everything is perfect. All teak wood perfect and assembly easy . Packaging protected it well. Thanks. We really do love your products! I want to compliment Shawn in your customer service department. I own the Moa Teak Shower Organizer and love it. My Contracter retiled my shower and lost the gasket. I needed to order another set and Shawn suggested the teak oil to keep the organizer conditioned. Great company and great service. 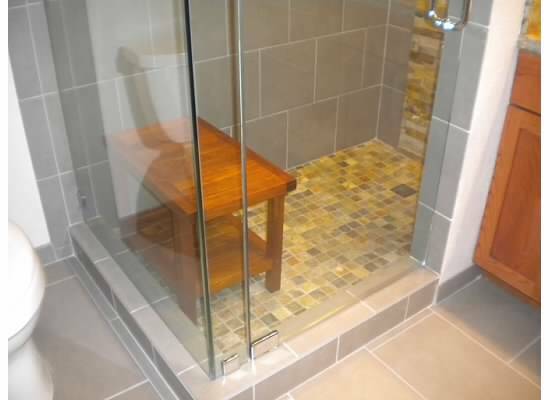 (The Original Spa 18" Teak Shower Bench) This is a nice little shower stool. Good experience overall with order and receiving. I would recommend this stool. I love how it brought my teak shower shelves back to life. I rated it highly on Amazon too! I will rate a 5 because it's exactly what I wanted and the quality is superb. We have been painstakingly building a house for a year and a half and decided that our new master bathroom deserved some teak useful accent pieces.... so we found 'Aqua Teak'. Over a few months we have purchased several of Aqua Teak's beautiful products and we still have at least one more to go. The teak is of high quality and colour and the workmanship is flawless. They are easy and quick to assemble. When the pieces are oil up and wiped even more of the richness of the wood comes through. They come well packed for safe shipping. The Asian Teak Shower Bench is classic with lovely lines and is very solid. Gorgeous to look at and of course use as intended. 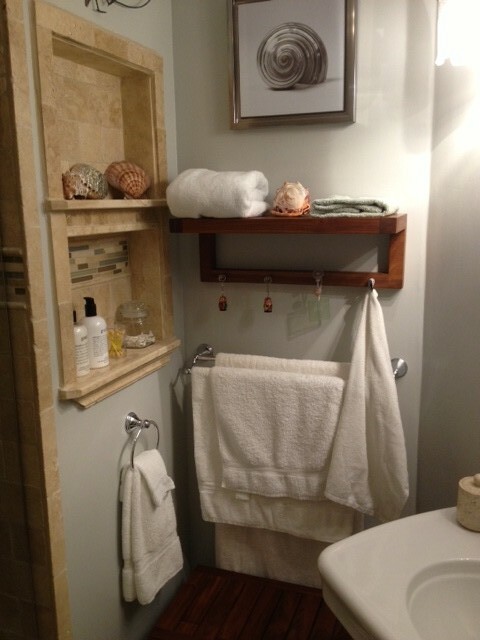 Next we purchased the Original Sula Towel Rack with its simple lines and good height, it easily holds bath towels. At the same time we bought the glass suction cup or wall mount teak hook. This is the only product that didn't have as lovely teak as the other pieces. I sent Aqua Teak a note with a picture and said I did not want to bother exchanging the item and that I was only sending it to them for information only because it wasn't the end of the world on such a small item. Well, Aqua Teak, immediately decided to mail us a new hook which has now arrived. It is, bar none as perfect as our other two pieces. This high standard, customer satisfaction oriented company offers professional, friendly and excellent service. Over the several purchases I have had an opportunity to speak with several different staff and all have been knowledgeable and excellent and to talk with about products and unusual shipping requests we needed to make. Thank you to everyone and Aqua Teak and because of your high business ethics ensuring we were 100% satisfied with ever purchased piece - even the smallest one! I wish more companies took such pride in their products and offered such excellent service. Hi, My order arrived a few minutes ago & super easy to assemble. Great product, very well made, high quality wood, looks great. I wish just for myself it was about 24 inches high instead of 18 inches. Like I said just my opinion not a flaw at all. I'm handicapped and the extra height would make it easier to get up and down. We ordered the teak corner shower caddy and it arrived very quickly. It is by far the most beautiful shower furniture I've ever seen. 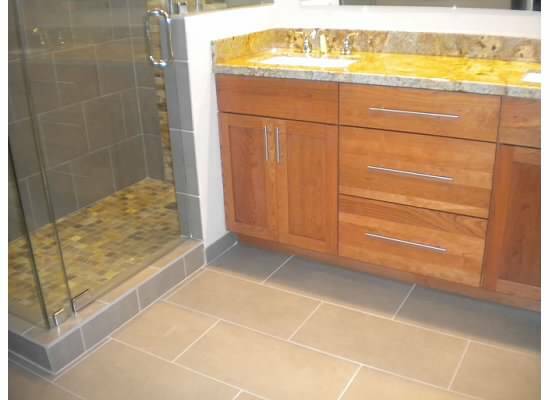 It was simple to assemble, is very solid and is perfect for our walk-in shower. When we need a teak bench for our patio or garden, we will know where to look. Thank you! I am finally able to open the package. My bench is beautiful and easy to assemble. My daughter LOVES the bench. Great purchase. Great quality. When the bench arrived, it had a slight crack in one leg. I called AquaTeak the next day and they arranged to pick it up and send me a new one, all of which happened very quickly. Terrific customer service and the bench is as so many others have noted, well constructed, extremely sturdy, and nice looking. We use this in our entry way as a bench for changing into and out of shoes. Doesn't take up much space and looks great. Fine company and product! My wife and I give it 5 stars. It’s a perfect fit for our walk-in shower. We received our bench and oh my gosh it is STUNNING! Absolutely beautiful. Will absolutely purchase from AquaTeak again! Love my shower bench!!!!!!! It rocks! I own two! Tell the world! The bench was delivered today all in great condition. My husband, whom it was for, put it together right away and he absolutely loves it. What a beautiful product and I wouldn't hesitate for a second to recommend your store/company. It's here! It's amazing! I LOVE it!! Took 5 minutes to put together! I am spreading the word! Thank You, Aqua Teak! Thank you!! The bench was delivered yesterday, (Saturday) and we weren't expecting it until Tuesday; you went above and beyond and I thank you for such great customer service. The gentleman's name who took my order was Christian, please pass along my thanks, he is a asset to your company. I wanted to tell you how much we love the little Asia shower benches. I put 3 in my Zen garden and one in my newly remodeled master bath. They are sturdy, extremely well-built, have a lot of sitting capacity, but leave a tiny footprint. I want to thank you for your help with my recent purchase. We ordered 3 of the ASIA teak shower stools for our new Zen Garden. When one of them arrived a little damaged I was apprehensive about how to get a replacement. You were very quick to resolve the problem better than I could have hoped for! We are very impressed with your customer service! We are also impressed with the product you sell - the ASIA stools are solid, well made, and extremely good looking. The construction of the stools is much better than expected, and far better than anything else I have seen on the market. They have a small footprint, but the size is deceiving. There is plenty of room to sit on the stools, and they are so heavy they would be fine for a larger person. The tone of the teak wood is beautiful, the price was reasonable, and I am sure they will last for many years. We like them so much we now have one in our newly remodeled master bathroom as seat by the shower. What a fantastic and versatile product! We will look to you first in the future when we have need of teak furniture. I wanted to send you the full grouping to show you how AquaTeak's bench was the catalyst and my designed inspiration for our bathroom renovation. 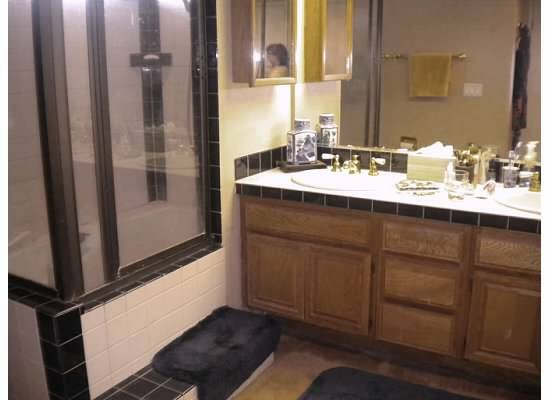 The first three pics are of the old bath; the rest is the final result. We had the vanity custom made to match your bench and it turned out beautifully. Your bench not only provided inspiration, we now feel much safer having a place to sit. Thank you again for your beautiful product! We are so pleased with everything! I recently purchased this 24" Asia Teak Shower Bench for my new bathroom. It is perfect as you can see. I am absolutely delighted with its design, ease of use and elegant simplistic style. It is solidly built and easy to put together. There are "rubber feet" on the base which protects the shower floor. I was concerned about the bench being stained. I did not want stain on the white and grey tiles. There is no problem as it has a natural finish. Thank you Aqua Teak. It is the icing on the cake! Although I NEVER write to anybody or leave "feedback" about purchases I've made online, I am compelled to say that I bought a few of your bathroom pieces recently and I must say that they are some of the finest works I have ever bought. Elegantly simple design and perfect craftsmanship. Top quality furniture for very reasonable pricing. Thank you so much for all your help. I did want to commend you for your exceptional customer service! Many companies say they provide this but few achieve your success. Your willingness to hear a problem and provide prompt solutions was so appreciated! Thank you so much. There are not many businesses any more that have the quality customer service that you do. I will absolutely do business with you again in the future and I will leave amazing feedback regarding my experience. I received my stool last night, and have to say it is lovely, far surpassing the picture on your website, and excellent value. Having just completely remodeled my bathroom, to bring it into the 21st Century. I needed a small stool to complete the final look, and this has been obtained with your bathroom stool. It took me a long time to find what I was looking for, but once I found your website - there it was. I will be adding a Florida Room to my house in the next few weeks and am considering Teak patio furniture.